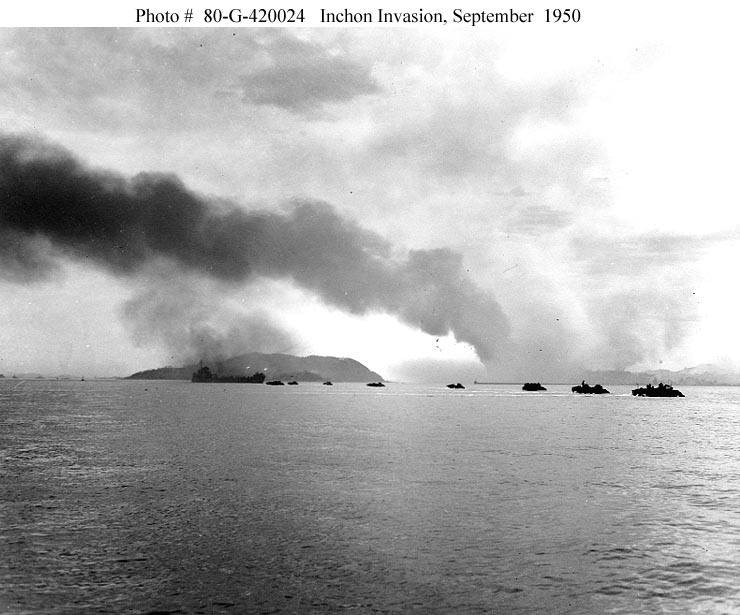 The Battle of Inchon (Korean: 인천 상륙 작전, Incheon Sangnyuk Jakjeon) was an amphibious invasion and battle of the Korean War that resulted in a decisive victory and strategic reversal in favor of the United Nations. The operation involved some 75,000 troops and 261 naval vessels, and led to the recapture of the South Korea capital Seoul two weeks later. The code name for the operation was Operation Chromite. 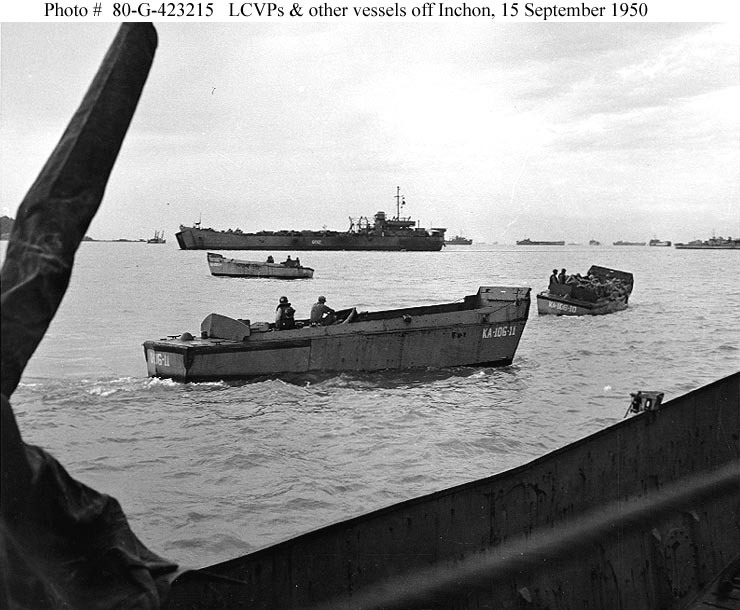 The battle began on 15 September 1950 and ended on 19 September. Through a surprise amphibious assault far from the Pusan Perimeter that UN and South Korean forces were desperately defending, the largely undefended city of Incheon was secured after being bombed by UN forces. The battle ended a string of victories by the invading North Korean People's Army (NKPA). The subsequent UN recapture of Seoul partially severed NKPA's supply lines in South Korea. USS Missouri in Inchon Harbor giving fire support around 2:30-3:00 a.m.
U.S. Marines landing at Inchon as battle rages during Korean Civil War. Location Inchon, Korea Date taken 1950. Photographer Hank Walker Life Images. Korean War. The Port of Inchon, Korea, is a hub of activity on Jan. 25, 1953. Inchon, Korea U.S. troops prepare to disembark from USS LSU-1317 at Charley Pier, near Inchon's Tidal Basin, 29 December 1950.